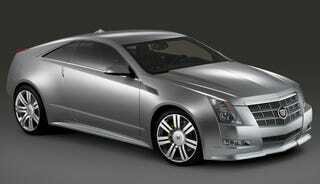 We saw the Cadillac CTS Coupe concept in person at the Detroit Auto Show in January. We've also seen the production version of the CTS Coupe in spy photos last week. Despite all that CTSexy action out there, it's taken a wee while for the folks at the General's luxe brand to deliver some of the hot press shot action. Yes, seriously, we haven't seen a single press-managed picture of the talk of the town from this past Detroit show. But despite the wait, we're still happy as hell to have them for you below. Enjoy.